It’s been a little over two weeks since RH92 was tagged. She has been busy exploring up and down the coastline near where she was born, and she’s been making a few friends, too–there’s Temp325, RN44, RN30, 3CU, RK05, RV18 and even recently de-hooked RF28 sporting a tracking device on his back. We have not witnessed her eat any sea cucumbers, as many weaners inevitably do, but she has tried seaweed. 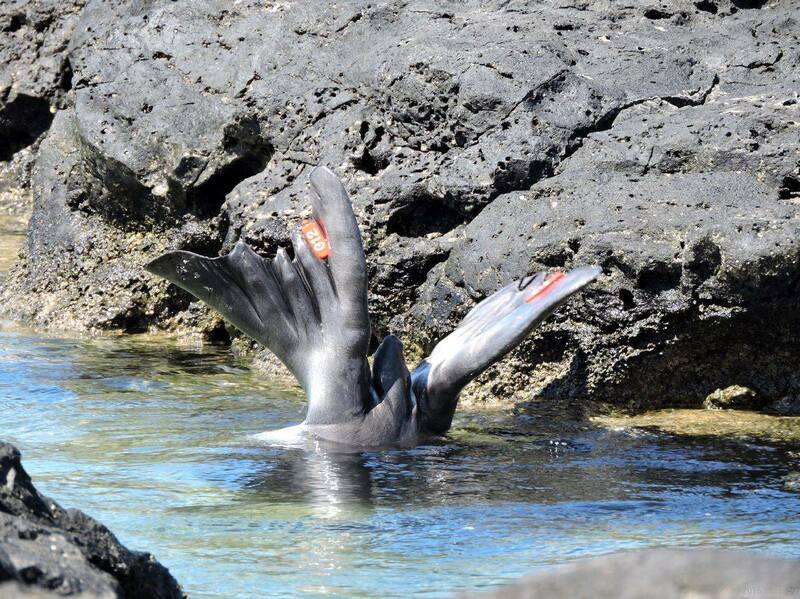 Basically, she’s just being a wild monk seal and doing a good job of it, at that. Here are a few photos of her escapades. PK2 just keeps on getting bigger. And RK22 smaller. Two swims today one of an hour and a half, then another one hour and forty-five minuets. Three feedings observed. Males RV18 and RK05 both visited both locations but did not haul out. Also had 3CU and Temp 325 in the area. Meanwhile, PK3 learns about body control. Seems mom/RK22 and pup/PK2 had a busy day today. Our volunteers logged two swims lasting two hours each and five feedings. Plus, three males–R8HY, RK05, and RV18–all paid visits, causing some displaying that is all part of the social dynamics of these animals. Mostly, the males are posturing to let mom know they’ll be ready when she goes into estrus again some time after pup is weaned. 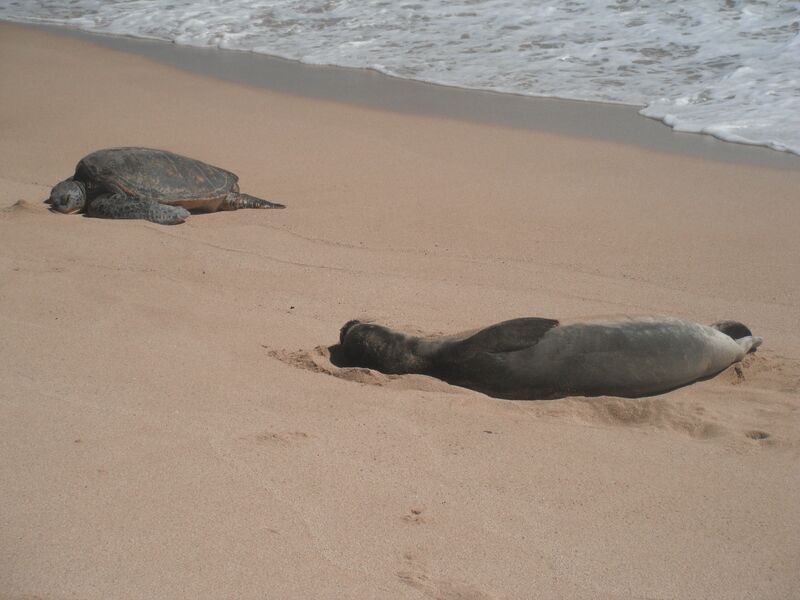 Sometimes, a male simply hauls out and sleeps on the beach somewhat near mom and pup. He may inch or roll toward her. All moms respond differently, but if/when a male gets too close, mom will raise up and give him a piece of her mind, and the male will back off if not leave the beach altogether. If a second male appears, the two males may tussle, typically with the more dominant one staying and the other swimming off. There is rarely physical harm done to any of the seals involved, but important messages of hierarchy are being communicated. Of note is R8HY. 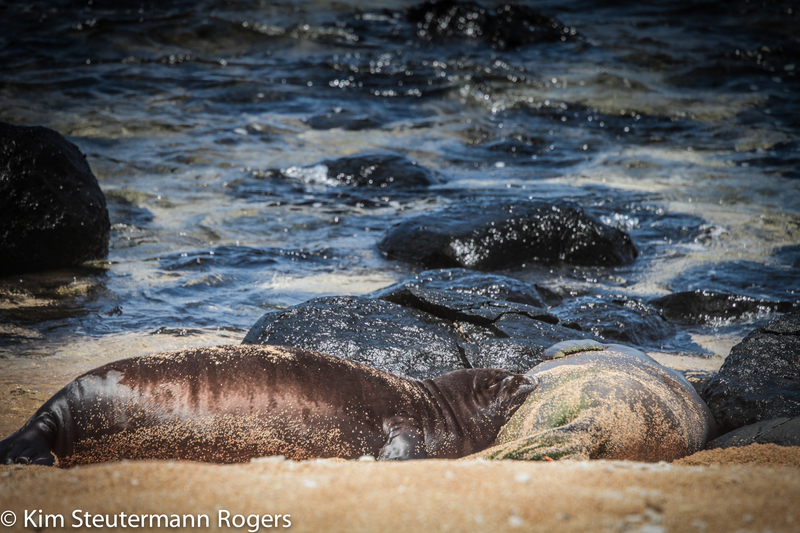 Until quite recently, he’d been sighted regularly on O`ahu, perhaps a 100-mile journey, giving you an idea of the distances these seals can travel. We have three pups in three stages. G13 weaned after 43 days, and is exploring the reef, spending much of her time in the water like this–sticking her head under rocks and crevices. She’s also sporting spiffy flipper tags–G12/G13. This is the time of her life where she’s figuring out what’s good to eat. She’s likely snacking on things such as sea cucumbers that won’t continue to be part of her regular diet. G13 has a good store of fat. Hunger is not yet driving her to forage far and wide. She continues to hang out near her natal beach but is starting to range a bit more. As she gets more confidence, stronger, and hungrier, she will forage outside the reef farther off-shore, and we’ll find her hauled out on beaches elsewhere on Kaua`i. RK22 weaned PK2 after 41 days of nursing. Likewise, he is healthy and plump and sticks close to the beach where he was born. The two weaners have even been sighted rolling in the shallow water together. 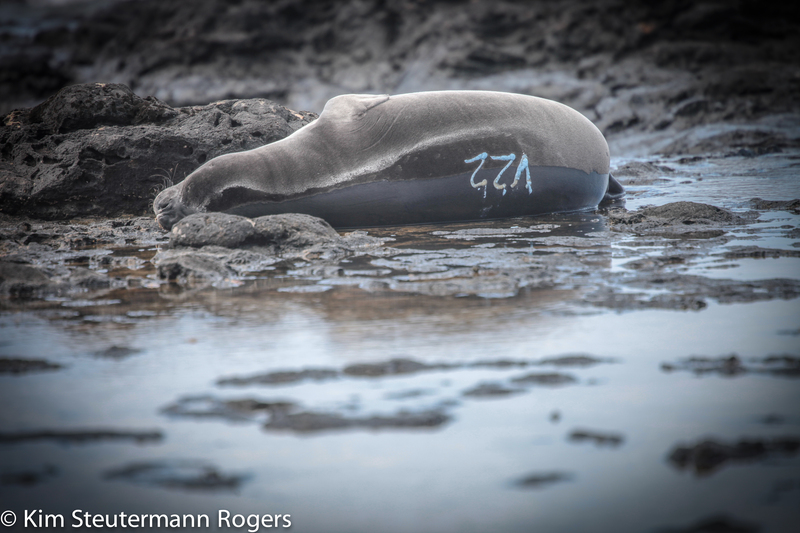 Shortly after PK2 was weaned, he was bleach tagged on his side as “V22.” Soon, he’ll get flipper tags. 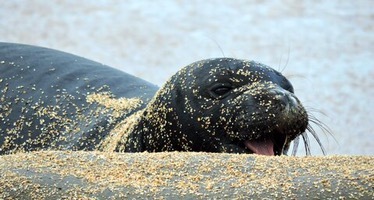 Both weaners are often visited on the beach by various males, including R8HY, RK05, T320, among others. RO28 continues to nurse PK3, who can get quite vocal when he’s hungry, and has even been known to vocalize while he’s nursing–as well as, fall asleep while receiving his regular nutritious nourishment. His girth is nearly the same as his mother’s, as she has not feeding during these past four weeks. 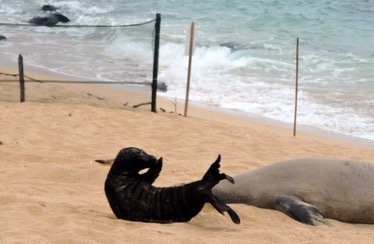 This is normal monk seal biology. It’s her own hunger that will finally force 028 to wean her pup. When she does, PK3 will be on his own, swimming the seas and mastering seal life.